Calculate the slope of a line drawn on an x and y coordinate coordinate and also given the coordinates of two points on a line in this interactive online math test. 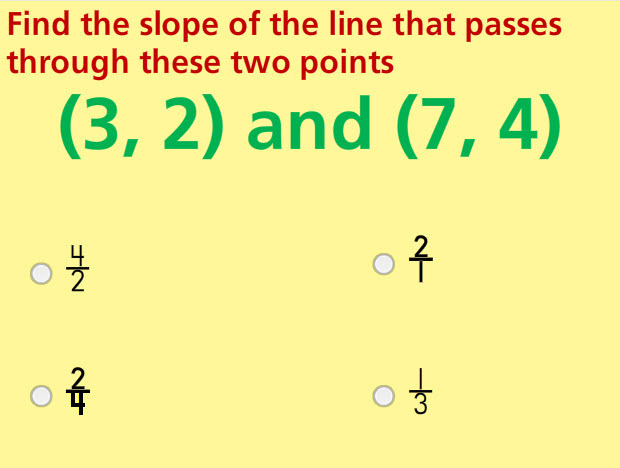 This test has ten multiple choice and drag-and-drop problems to calculate the slope of a line passing between two given points in this online math test. Find the unknown coordinate given the coordinates of a point on a line and the slope of the line. Using a graph, calculate the slope of a given line. Find the slope of a line given the coordinates of two points on the line. Return from this Slope Math Test to the Middle School Math Tests, 8th Grade Math Tests webpage, or to Math Tests.